adidas’s marketing pitch: Shoes with endless energy for long city runs. Upper: Stretch knit mesh, synthetic midfoot panel, butterfly heel clip. 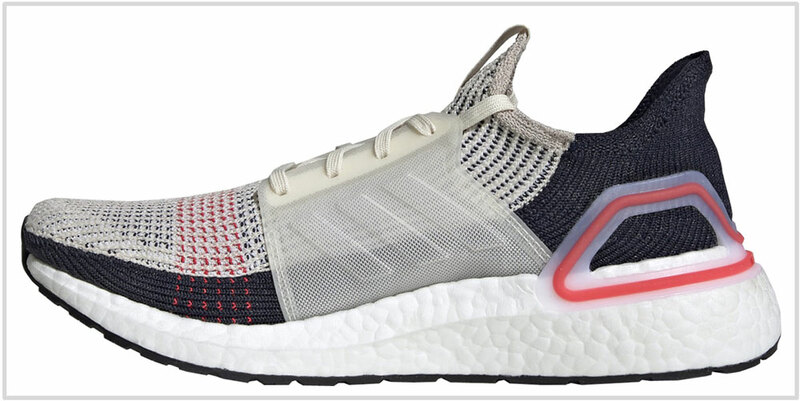 Midsole: Full-length Boost e-TPU foam, plastic Torsion spring. 10 mm heel-to-toe gradient. Outsole: Single piece of Continental rubber. The cushioned Ultraboost gets an update after four long years. All changes on the Ultraboost 19 are improvements. 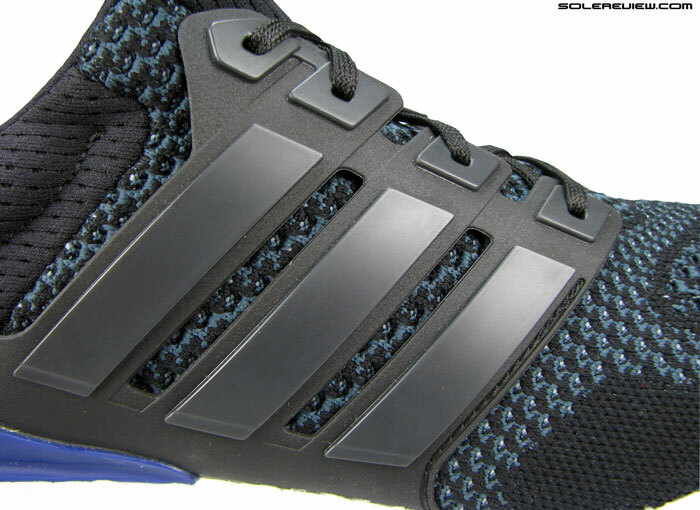 The upper gains more space, the plastic cage is gone, and there’s even more Boost foam padding your feet. The original UltraBoost was far from perfect. The later versions incorporated a new outsole for improved durability and grip but the plastic cage and the crushing forefoot fit exists on the standard Ultraboost even to this day. Even adidas knew how bad the plastic cage was. So much so that they actually profited from it. We’re not kidding. Why else would they feature a cage-free version named the Ultraboost Uncaged? 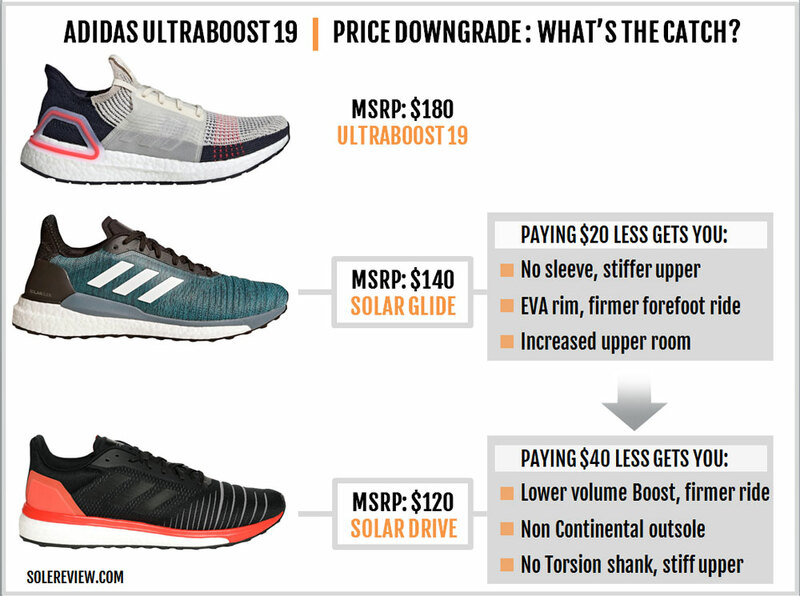 Despite its many flaws, the Ultraboost went to become the best-selling shoe in its price-segment. A shoe is a sum of parts, and in the Ultraboost’s case, some were greater than the others. The cushioned and bouncy ride ensured that other imperfections were swept under the rug. 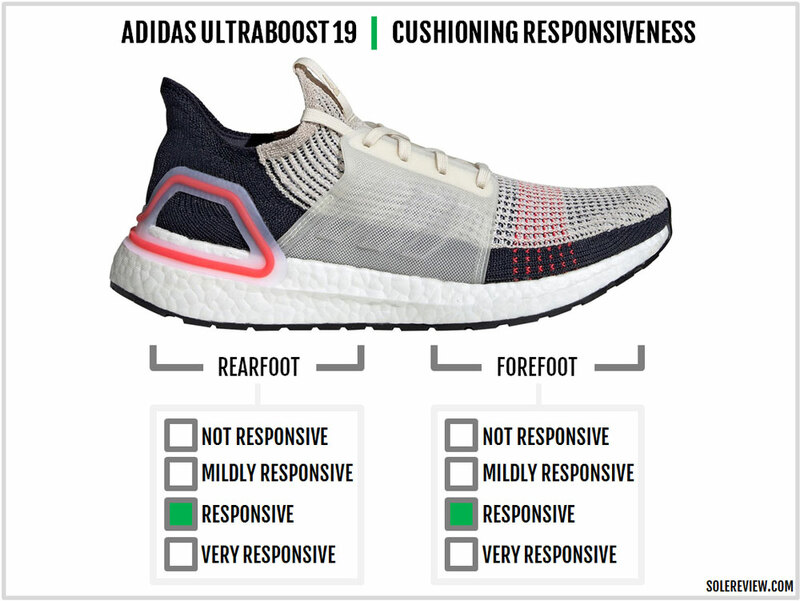 It also helped that the Ultraboost was adopted by casual-wear consumers who overlooked features which would otherwise be missed under performance running conditions. Make no mistake; the Ultraboost 19 works better for lifestyle use than performance running. But for whatever it’s worth, the UB 19 is a much better version of the Ultraboost OG. The forefoot has more room. The heel fit is more comfortable. The UB19 is easier to slide into than the OG edition. There’s even more Boost molded into the midsole. The outsole grip has improved. Most importantly of all, the much-disliked cage has been replaced with pliable synthetic panels. Two things instantly stand out on the Ultraboost 19. The updated midsole has a lot more Boost than the standard version. 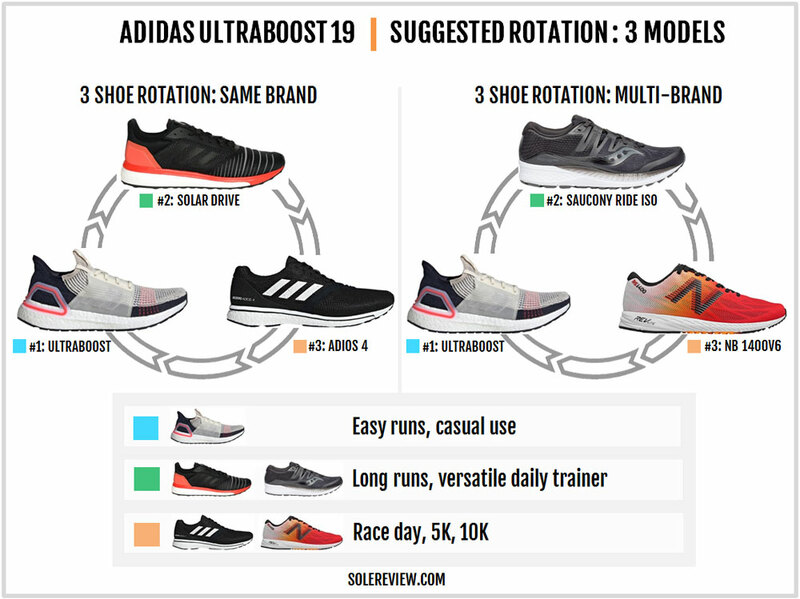 Most of the Boost increase happens under the heel and the midfoot; the forefoot gets a tapered topping of extra foam. The standard Ultraboost has a bit of a sink-in effect. On the 19, this sensation is less pronounced, and you wonder why – considering all that Boost that’s added to the new midsole. There are a couple of reasons, and one of them doesn’t even have anything to do with the midsole. The standard UltraBoost and the ST version have a perforated lasting fabric below the insole. 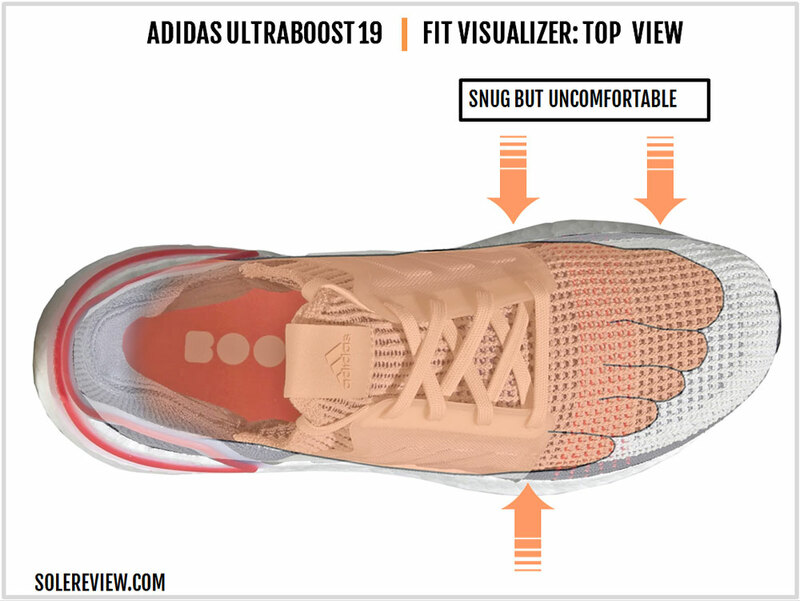 This gives the foot easier access to the Boost foam, which in turn results in the soft, sink-in experience. 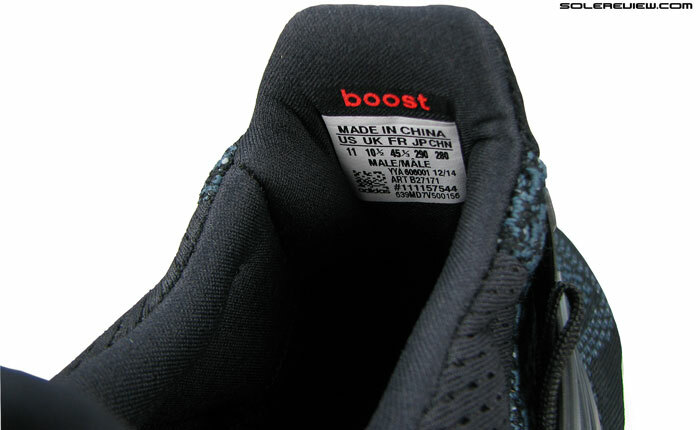 The Ultraboost 19 doesn’t have this grid-like fabric under its insole. The new fabric base lacks any perforation and makes it less easy to sink into the Boost midsole. The other reason is the outsole geometry. While the UB 19 has a similar looking ‘Stretchweb’ outsole, subtle differences exist between the two. The windows on the updated outsole are smaller than the previous design. The cavity where the Torsion Spring is embedded is also shorter and narrower. As a result, it’s more resistant to flexing than the original layout. The smaller windows also lead to a design change of the lugs. They go from the circular to rectangular and offer a greater contact area. This improves the UB19’s grip, an area which was already good. A new Torsion spring comes installed with the UB 19. And what has changed? Frankly, not a lot. Like the older design, the Torsion component forks out to the forefoot and heel. There’s only a single visible change; the small ‘dam’ at the base of the inner midsole is gone. The midsole heel design is interesting and unlike anything we’ve seen before. A urethane clip is fused over both the upper and the sidewall, thus adding stability to the soft midsole. The Boost sidewalls are already cupping the upper so to speak, so the skeletal clip only augments the cupping action. This, to us, is a marked improvement in the heel counter design. The new counter is movement-friendly so it works together with the softer components without getting in the way. Running in the Ultraboost 19 reminds us of the Ultraboost ST. 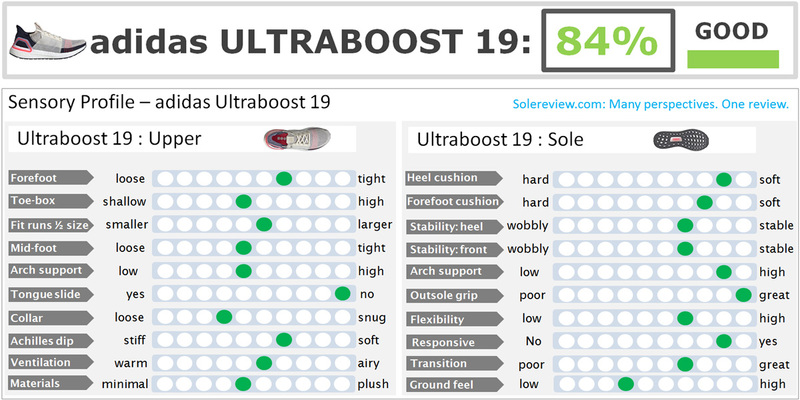 The ST version had more Boost than the regular version, with most of the said increase packed into the heel and midfoot. And just like the ST, the under-arch area feels substantial. 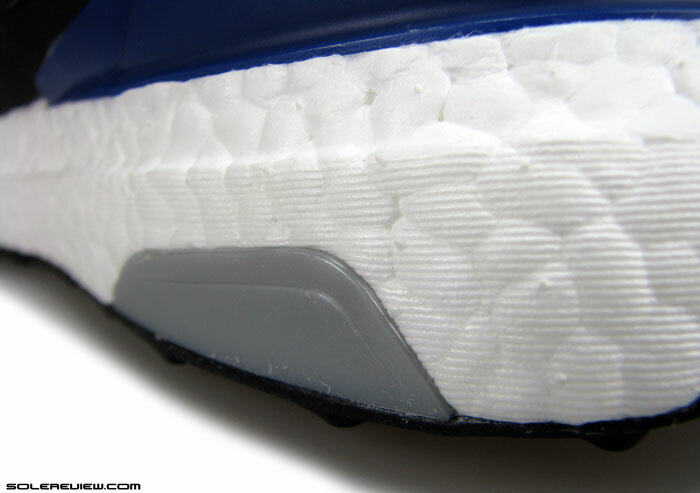 The UB 19’s inner midsole has higher sidewalls with more Boost foam underneath. The rest of the midsole is more cushioned, and that’s no surprise considering the increased volume. While the molded insole has a new reverse-molding design with smaller squares, its softness is similar to the outgoing version. It’s worth pointing out that adidas uses a different kind of Boost molding here. There’s a fine, ribbed texture all over the Boost midsole which didn’t exist previously. The foam pellets have the same softness and size though. The UB19’s deeper cushioning comes with a firmer top and bottom layer due to the new upper and the harder outsole. You don’t sink into the UB19’ midsole the way it was with the OG version and even the ST. And we already explained the reason why that happens. Boost foam has plenty of inherent bounce. At the same time, responsiveness is improved due to the knit covering under the insole as it acts as a trampoline of sorts. Saucony Grid, anyone? The UB 19 might have left the plastic bits behind, but it is still an 11-ounce shoe. It is bottom-heavier than the OG model due to a more minimal upper and a larger Boost midsole. The standard UB has a better weight distribution, something which is noticed during runs. In fact, even with the identical weight, the regular UB feels lighter than the 19. 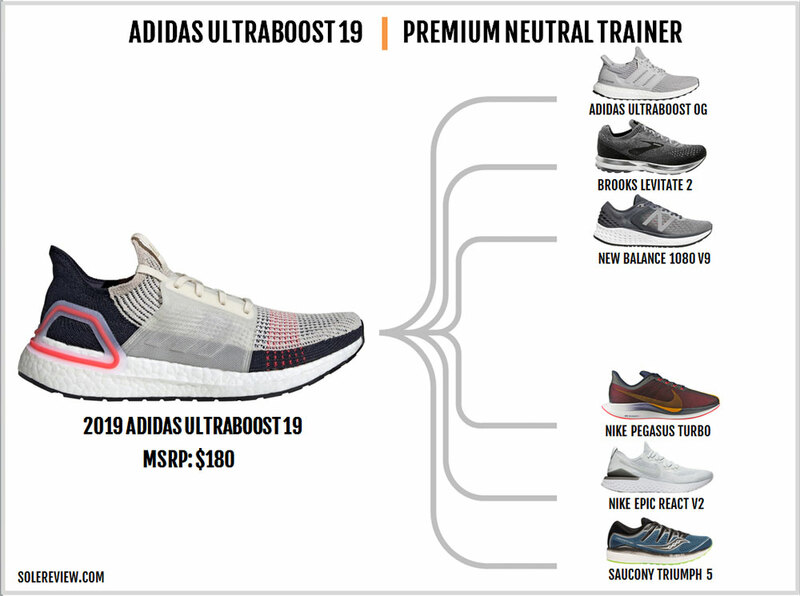 As such, the Ultraboost 19 meets the needs of a comfortable daily trainer which goes very easy on your feet. It’s also a capable long-distance hauler at easy speeds. Due to its softness, we don’t recommend the Ultraboost as a shoe for faster runs. Besides the weight, the upper isn’t suited for quicker workouts – it’s got an easygoing fit. 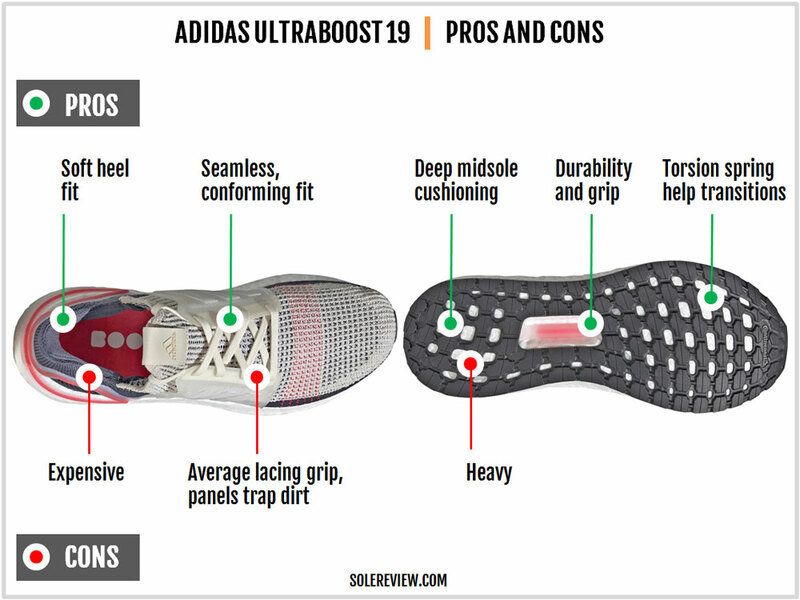 We never thought we would say this, but the regular Ultraboost’s tighter upper fit and relatively lower-profile midsole make it more performance-oriented than the 2019 version. Boost has excellent cold-weather resistance. The cushioning stays the same whether you’re running in muggy summers or frigid winters; it is truly an all-season running shoe. Performance-wise, the new midfoot design and the mesh make the most difference, so let’s lead with that. A thin, pliable set of synthetic panels replace the rigid plastic cage of the first UB. Unlike the hard shell, these panels flex along with the upper and don’t feel like separate components hemming the foot in. There are no pressure hot spots either. The soft layer fits flush over the midfoot. Despite the improvements, the new design isn’t perfect. The lacing doesn’t quite have the level of lock-down required of a running shoe. The deconstructed upper lacks any padded tongue or collar lining (the standard UB has). Without padding, the level of lacing play comes down a notch. After all, the sensory perception of great lacing cinch is as much about the padded base. Another factor is the coverage area of the lacing panel. There are just four eyelets crammed into the panel, heel lock lacing not included. The first lacing row also begins further away from the front – even when compared to the standard Ultraboost. It’s not surprising that the midfoot lock-down doesn’t meet the standards of performance running. The panels look like mesh, and to some extent, performs like one. But they don’t let air through and make the midfoot warm. 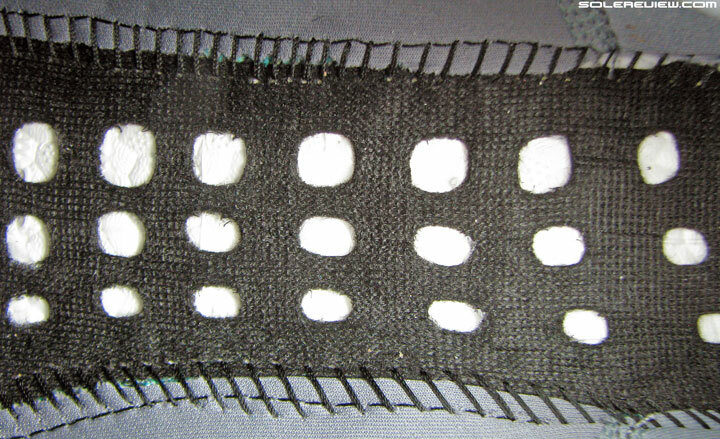 The panels are partially stitched in the front and rear to form a pocket in the center. Over time, small debris and dust get lodged between the plastic and the upper. Periodic maintenance is advised. The forefoot fit is snug but nowhere as narrow as the standard version. The sizing fits true and there’s a bit of shallowness in the toe-box. As a whole, the forefoot and toe area is roomier than regular UB. A supportive knit structure is integrated into the forefoot and the midfoot – those are the red bands you see on the upper. adidas makes changes to the heel section too. The piped clip is easy on the heel while providing adequate cupping around the foot. The inside of the heel has a soft felt-like lining with molded foam pods for grip. The rest of the collar and the tongue flap is unlined with moderate levels of elasticity. It’s easy to slip the UB 19 on and off, a nod to its casual-use intent. The UB19 is one of the most durable shoes on the market today. Its Boost midsole and Continental outsole set-up ensure many miles of ownership. The stretchy upper is also unlikely to cause any problems. 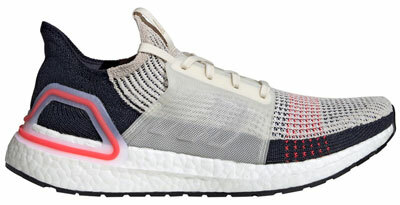 The Ultraboost 19 is a comfortable and lively daily trainer. The high-volume midsole is very easy on your feet; you’re never left wanting for the lack of cushioning. The shoe is as durable as it gets with plenty of traction offered by the Continental rubber outsole. The upper stretches over the foot for a conforming fit without pressure points. The midfoot wrap is softer but it tends to block ventilation and accumulate dirt within its pocket. 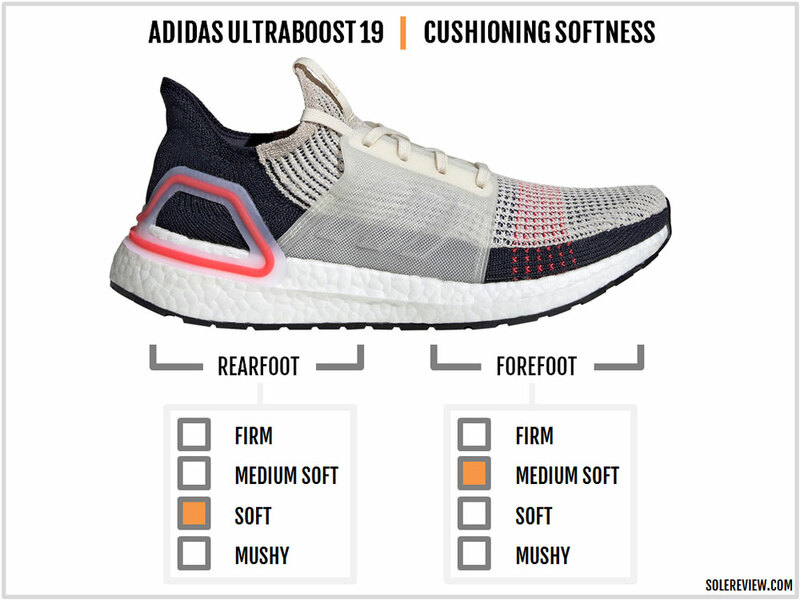 There a few areas where the Ultraboost 19 doesn’t do well at. At nearly 11 ounces – and most of it condensed into the lower section – the shoe’s capabilities are limited to easy runs of any distance. It’s hard to coax fast miles out of the shoe; there are better choices available. There’s also no reason why the Ultraboost 19 should be priced so high. We’ve seen adidas shoes which cost nearly half to feature a rich material pack which includes a Continental rubber outsole. As far as the Boost foam is concerned, another German brand sells its version for less than $100. At most, the UB should have a $150 sticker. Choosing the $40 cheaper Solar Glide gets you a shoe which is more performance-friendly than the Ultra. The upper fit is more secure and the EVA rims provide increased stability. A $120 retail price buys you a markedly differentiated and firmer ride in the form of the Solar Drive. The Boost midsole is lower volume than the Glide and the Ultra, and there’s an entire layer of firmer EVA on top. The upper is a little stiff and takes some time to break in. There’s no Continental rubber so the lifespan will be lower. 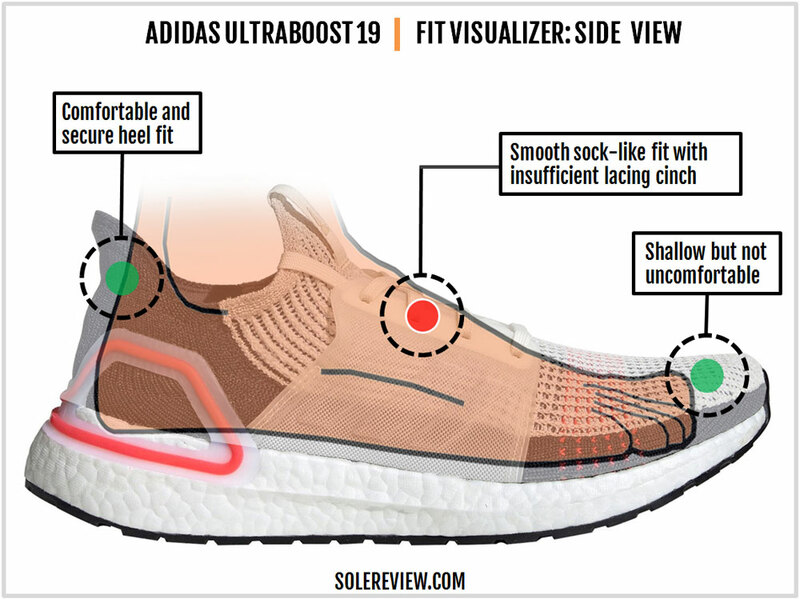 The Ultraboost 19 has too much squish for shorter races. The adidas adios 4 or the New Balance 1400V6 meet those needs. For something in between, the Solar Drive or the Saucony Ride ISO are versatile neutral runners with just the right amount of cushioning. The standard (older) Ultraboost is the closest one can get to the UB 19. If you’ve read so far, you know what the differences are. You get a soft but lower-profile Boost midsole and a narrower upper. The Nike Pegasus Turbo and the Epic React V2 are excellent lightweight and cushioned alternatives. This is relevant if you need a shoe with better performance versatility. Both models are ounces lighter and will run rings around the UB19. 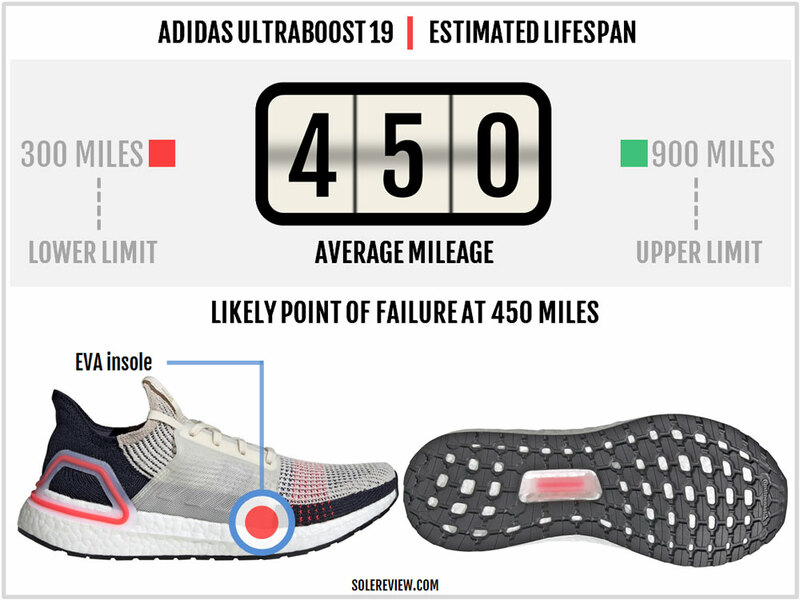 You won’t get the durability of the Ultraboost, so that is the trade off. The New Balance 1080V9 is a very cushioned long-distance shoe with a better upper fit. The Fresh Foam midsole doesn’t have the lively bounce of adidas Boost, but it offers a clean ride experience. We’ve left out the Fresh Foam More because we don’t have miles on that shoe – yet. The Triumph ISO 5’s midsole is made of Everun, a firmer version of the Boost foam. So there’s plenty of high quality cushioning. The soft ISOFIT upper does a better fit job than the Ultra, and the firmer Everun is more business-like. We didn’t list the Glycerin 17 here because it would have been the odd shoe out. 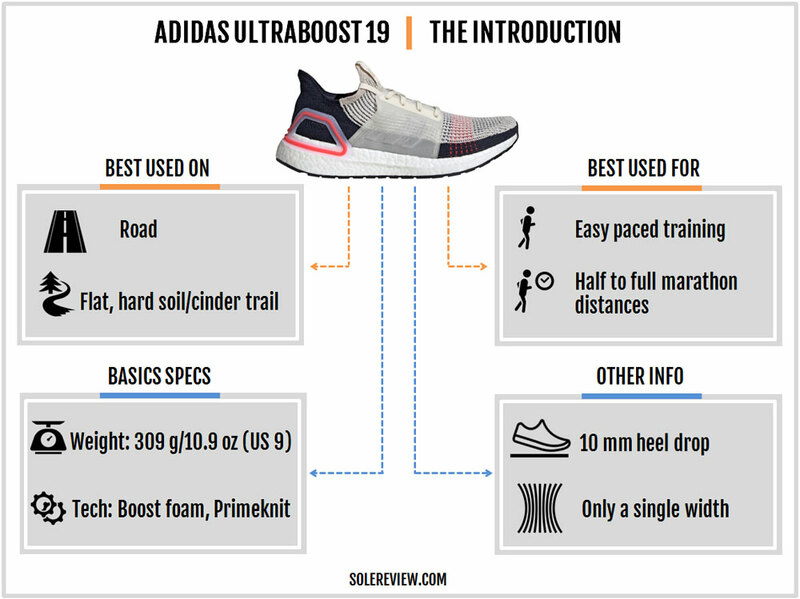 Instead, the Brooks Levitate 2 compares (somewhat) with the Ultraboost; its 11.2-ounce weight is nearly identical to the UB 19. The DNA AMP midsole offers a lot of vertical rebound within a firmer cushioning package.